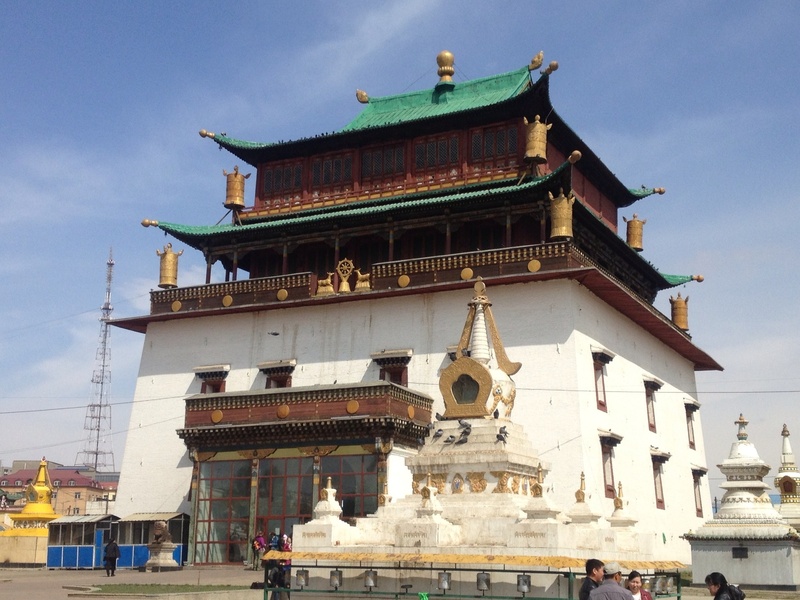 Luckily we were only staying in Ulaanbaatar for one night, because there didn’t appear to be a great deal of tourist attractions left to see in the city. 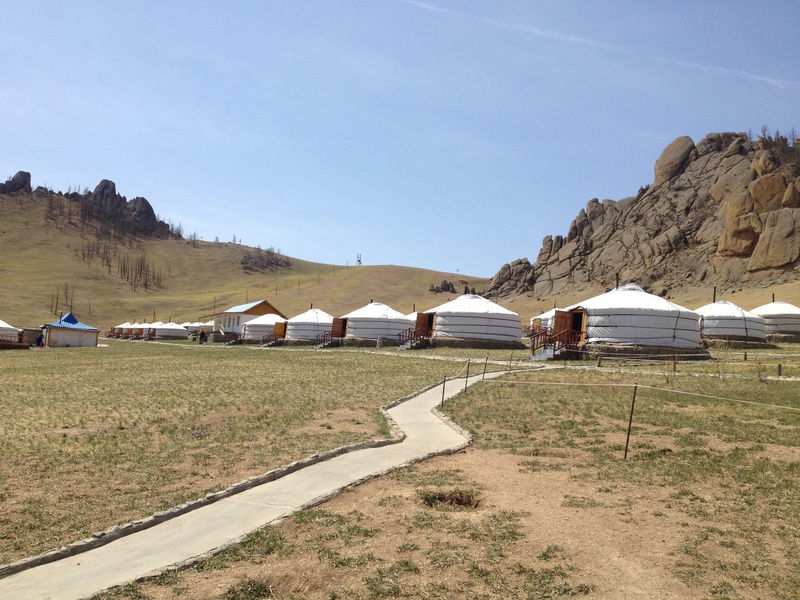 The rest of our time in Mongolia would be spent at a ger camp about two hours away, far off in the Mongolian wilderness. A ger is a sort of semi-permanent tent that the nomadic people of Mongolia live in – while Ulaanbaatar does have a population of about 3 million, there is a remarkable amount of people who still live the nomadic life out in the wilderness and the Mongolian national parks, moving from place to place with the seasons and taking their home with them, as well as their herds of livestock. 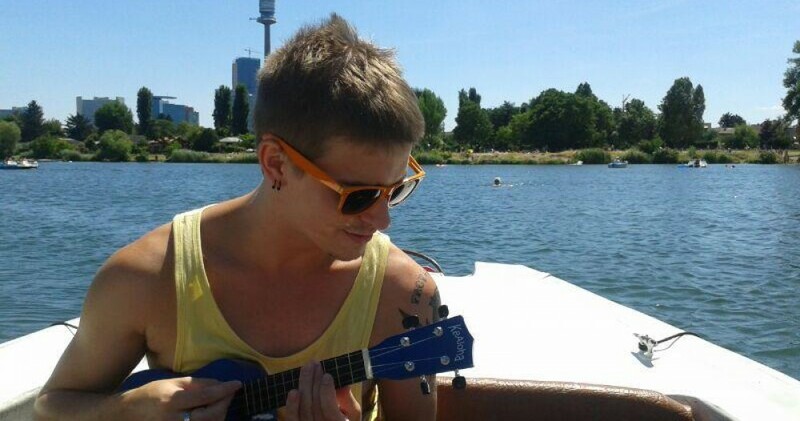 We had one stop in the morning on our way to the ger camp. The Gandantegchenling Monastery was a beautiful structure, and Oko explained that Buddhism is one of the major religions of Mongolia. It’s quite interesting how the landlocked country has so many different cultural influences from the surrounding nations, yet it truly becomes a melting pot that breaks all of them down and recombines everything into their own culture that is quite unique. We walked through the temple, silently moving around the people who had come to light candles and incense and to pray, before stopping at the monastery to watch the monks begin their morning rituals and listen to their chanting. I hate to admit it, but ever since my bizarre incident with the shady Buddhist monk in Lop Buri, I’ve been unable to look at any monk the same way again, and even just seeing one creates a rising anxiety within me. It really is such a shame, because I used to hold such a fascination for ideals and spirituality behind the religion, and now those beliefs have been well and truly tainted. I listened to the chanting for only a few moments before stepping out of the low-hanging canopy of incense and into the fresh morning air. The main building of the monastery complex. Outside, in front of the main temple, there was a big pair of golden feet. Oko explained to us that the Mongols were attempting to build the worlds largest human structure, a Buddha even bigger than the Statue of Liberty. However, all of the money for the project comes from donations, so there is no scheduled finish date because no one really knows when they will be able to finish it. Oko had also mentioned yesterday that the weather in Mongolia only allows for construction to be done for two or three months every year, which is why there were so many construction sites and unfinished buildings in Ulaanbaatar, adding to the ugly, incomplete cityscape. 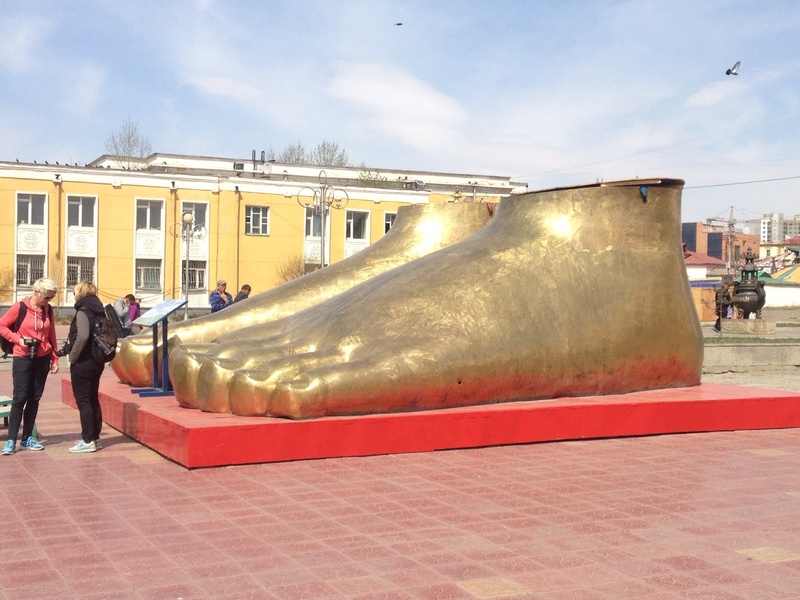 Golden feet – all there is of the statue so far. 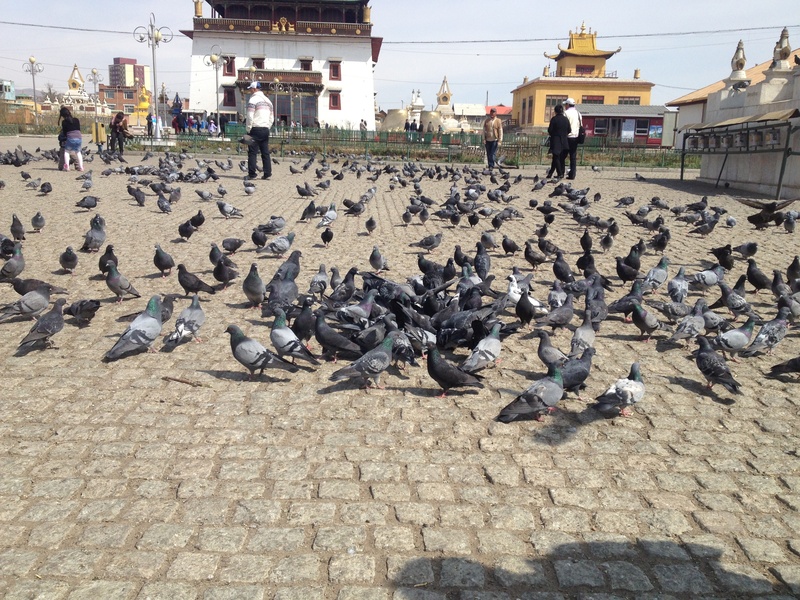 The mass of pigeons outside the monastery. After the monastery it was onto the ger camp. 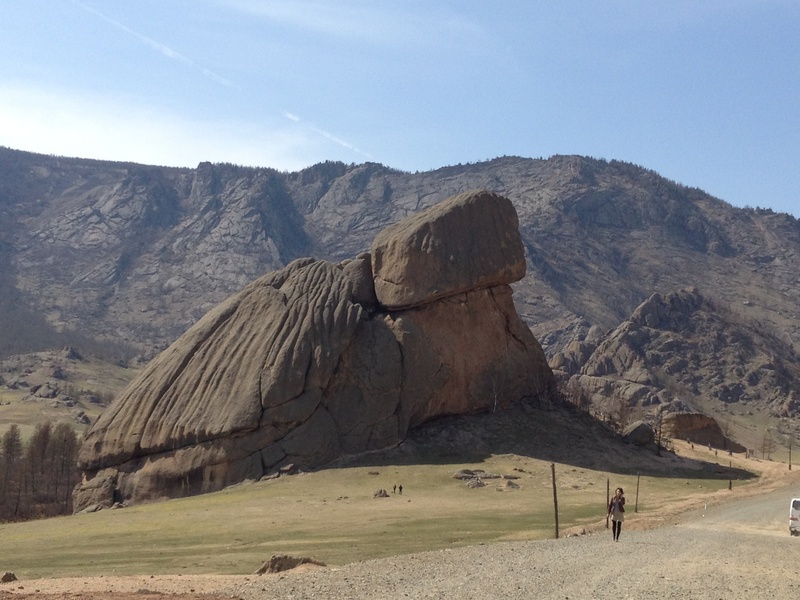 The place we were staying at was in a region called Terelj National Park. It was more of a permanent set up that was obviously designed for tourists, but they were the same style of ger that the real nomads live in. Each circular tent was several metres wide in diameter, and had a wood-fire stove set up in the middle, which were traditionally used for cooking all the meals, but would serve only as a heater for us during our stay. I was sharing my ger with Tim and Don, the other Australian guy on our tour, and after we unloaded our bus and settled into the gers, we went for a short drive to a small landmark known as Turtle Rock. 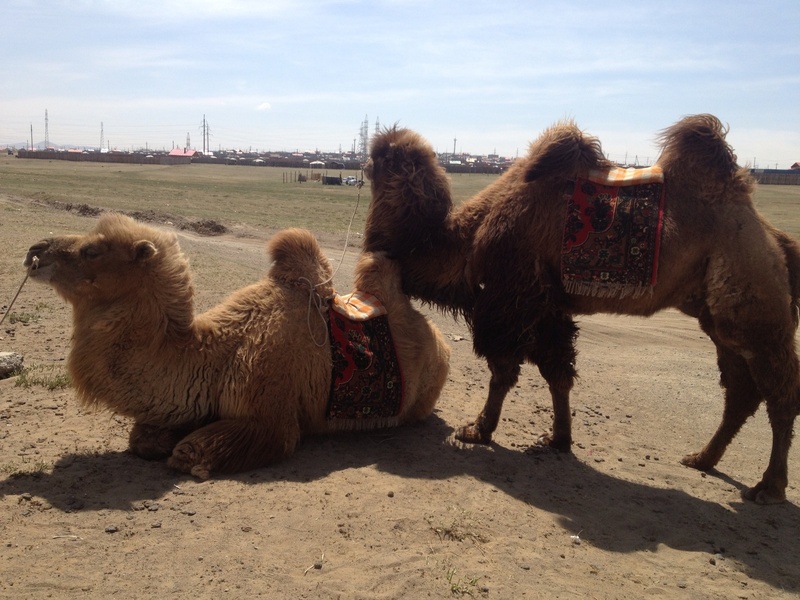 Some camels we passed on the way to the ger camp. We climbed to the top of the rock to appreciate the view. 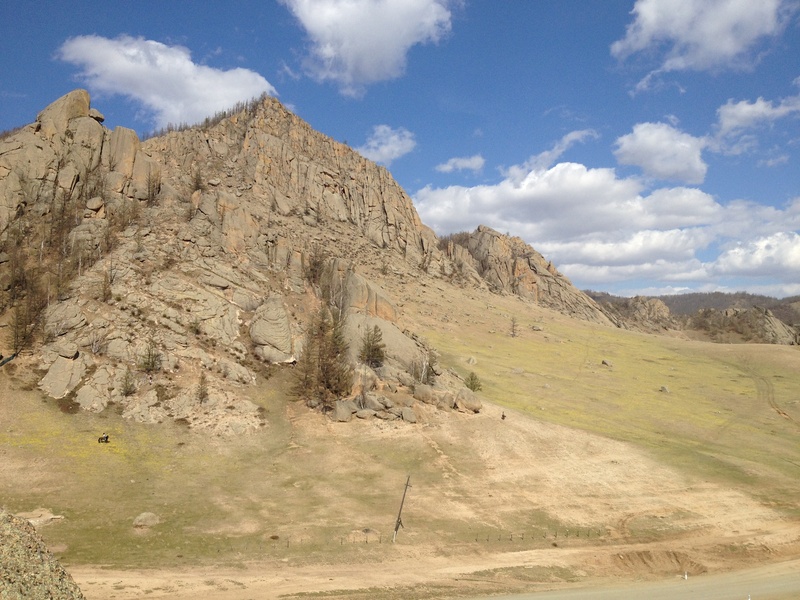 The Mongolian countryside really is beautiful. I spent a lot of time with my family in the Snowy Mountains as a child, and it was a familiar feeling of watching the virtually untouched landscape stretch out for what seemed like forever. Such sights always remind me of my fathers words about cities being similar from country to country, and I was even more pleased that we’d escaped Ulaanbaatar to explore the rest of Mongolia. 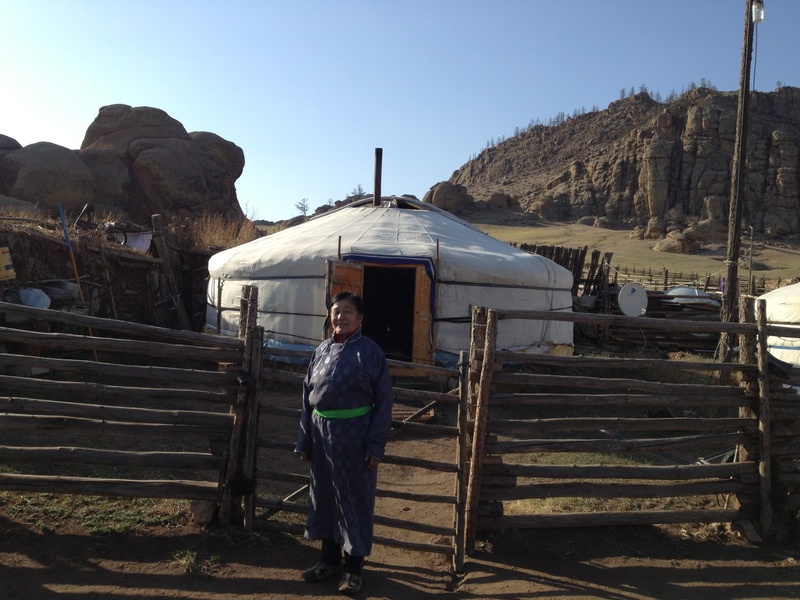 After Turtle Rock, we visited the ger of a real nomadic Mongol, and got to see what the inside of a truly inhabited ger looked like. The walls were lined with rugs to retain the warmth and heat, there was a TV and a fridge and a whole kitchen set up, and it felt like an actual home compared to our gers, which were essentially the hotel versions of the traditional Mongol dwelling. There was only one woman who lived in this ger, and she had prepared some food for us, so we asked her questions about Mongolian nomadic life, with Oko as translator, while we nibbled on homemade cheese and bread, dried yoghurt, and sipped on warm milk tea. I didn’t care much for the tea, and the dried yogurt was so hard I thought I was chewing bone, but after spending so long in South-East Asia it was quite a treat to have some hearty, homemade cheese. The view from the top of Turtle Rock. The ger of the Mongolian woman who we paid a visit to. It was definitely surprising how permanent the set up looked – apparently when they move, the nomads travel anywhere from a few kilometres down the road to hundreds of kilometres to a new region, usually for reasons of weather and climate or the availability of grass for their herds of cows, horses, goats, sheep or camels. It only takes 8 hours to completely dismantle the ger, which was deemed an impressive feat by our group. “It took me 8 hours just to pack for this trip!” Alyson exclaimed. We all had a bit of a laugh, but I suppose it was a reminder to all of us just how content people can be with so little in their lives. It feels like I have one of those epiphanies every time I visit a non-Western country, but I do think its important to retain that perspective throughout life, so I never end up taking for granted all the things I do have in life. 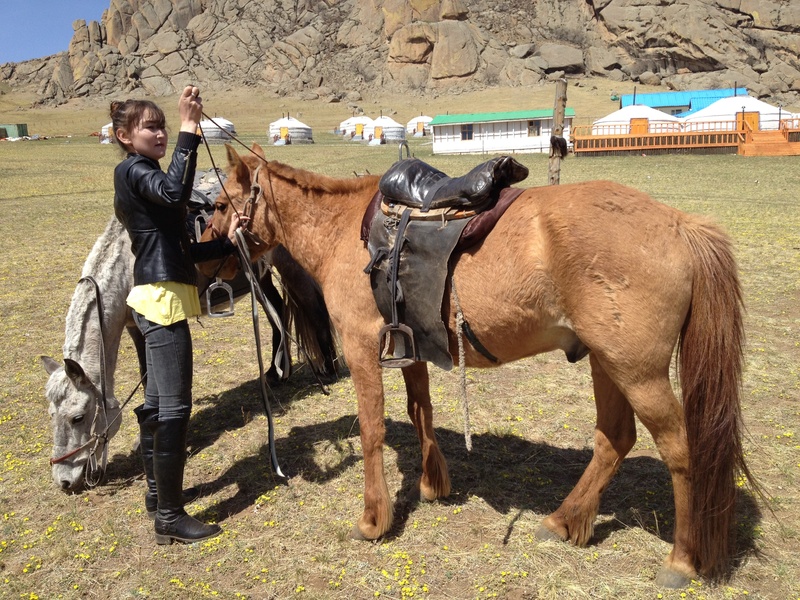 Our days at the ger camp were mostly spent outside, doing things like horse riding and archery. The warriors of the fearsome Mongolian Empire did both of those things are the same time, though horseback archery isn’t an easy skill to master in a few days, so we kept our attempts separate. We also made several small hikes up the hills and rocks that created the valley that our ger camp was in, and admired the awesome views. The hills rolled on in every direction, and in the neighbouring valleys we could see more clusters of gers, demonstrating just how common this nomadic way of life really is in Mongolia. The food in the ger camp was also amazing. Traditional Mongolian soups, salads and meat dishes, broths full of mutton and meat that melted in your mouth right off the bone, and hearty fillets of steak served with rice and potato. I wasn’t sure if there were any Mongolian restaurants around where I live, but I made a mental note to find out when I go back home – the cuisine is absolutely delicious, and I didn’t go to bed hungry once. Oko tending to my horse just after I dismounted. However, on one of the nights I did go to bed a little tipsy. As a group we’d decided we might get on the piss and have a little bit of a party in one of the gers. Some brought vodka, some brought beer or wine. I myself brought a semi-dry red that was made in Bulgaria, surprisingly delicious for the price that I paid for it. The conversation flowed freely, as is always the case when alcohol is involved, and I chatted a little more to some of the Australian girls who I hadn’t seen much of during the course of the trip. It was incredibly warm and toasty with the fire going inside the ger, and we frequently had to prop the door open for a little bit of relief, sometimes even stepping outside to cool off a little. The wine went to my head pretty quickly, but I remember standing outside with Dan and marvelling at the stars that were spread out across the dark blue night sky, thinking back to my night of stargazing on Koh Rong Samleon in Cambodia and still being a little bit excited that the constellations were all different in this hemisphere – and I don’t even think that was the wine talking. While the Mongolian countryside is breathtakingly beautiful, there are a few things about it that are a little upsetting. When you’re gazing out from the peaks of a rocky outcrop the land looks untouched, but the reality is that the life of the nomadic people takes a toll on the land. Some people burn or bury their rubbish, but there is still an incredible amount of pollution. You’re just as likely to see a plastic bag take flight into the wind as you are a native bird, and at regular intervals there are huge mounds of trash that are most likely the remnants of a ger camp that has since packed up and moved on. I remember as a kid going out on Clean Up Australia Day and picking up all the trash in my local area – I think realistically this country would need a Clean Up Mongolia Year. I absolutely loved my time in Mongolia and out in the ger camp, but it was always a little bit disheartening to walk past what appeared to be a small forest of plastic bag trees, the skeleton of what was once lively greenery smothered with black and blue and translucent plastic. The ger camp where we slept and lived for two days. 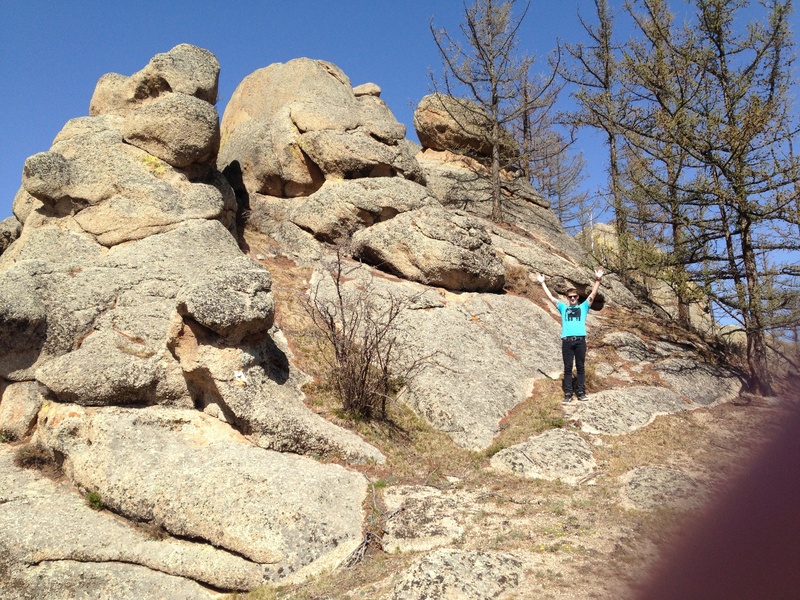 On top of some rocks after one of our many short hikes through the hills. 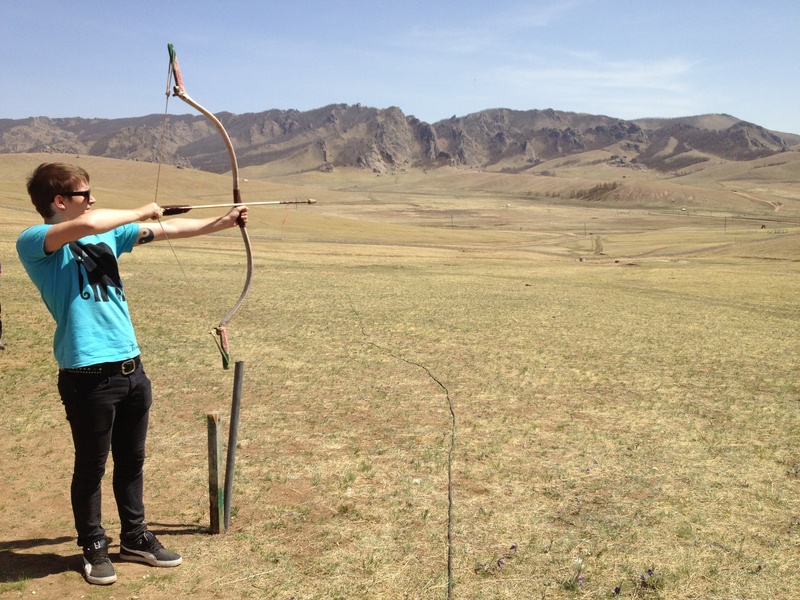 When we finally returned to Ulaanbaatar, we had an afternoon to kill before jumping on a train to Siberia that evening. We had lunch at a buffet style Mongolian barbecue, which was amazing – I ate so much I felt sick – and then spent some time at the National Museum. The more I learnt about the native Mongolian people and the mighty empire of warriors they had once been, the more I suspect that they as a people were the inspiration for the Dothraki tribes in Game of Thrones. Fierce warriors with highly revered leaders and a lifestyle that revolves largely around their horses, they were nomads that travelled across their vast country and were constantly at war to expand their territory. Modern Mongolia is a different story though, but I still got a little kick out of my geeky comparison. I also saw some exhibits about musical instruments – the name of the Mongolian instruments I’d seen in the show last time we were in Ulaanbaatar was morin khuur, a name that translates to ‘fiddle with a horses head’. The end of each instrument is finished of with a carved wooden horse head, and the morin khuur is considered something of a national treasure for Mongolia. As I wandered through the museum, I realised that most of the signs and information boards were in Mongolian, with no English translation. I hate being one of those tourists who just expects everyone to be able to speak English, and get angry when they can’t – I frequently struggle silently through awkward language barriers rather than go on a “Can anyone speak English?” spree – but I have to admit I was taken aback. Almost everywhere in South-East Asia had had signs in English, which I suppose I completely took for granted while I was there. English is a common and widespread language, but it’s by no means global or universal, and I think it took being in an official building like a museum, yet there still being very little English, for that fact to truly sink in. Overall, my time in Mongolia was incredibly interesting and unique. Combined with the fact that I wasn’t scammed, tricked, injured or molested, I think I can safely say its been my favourite place on my journey so far, and my only regret is that I couldn’t stay for longer. But the tour schedule was pretty set when it came to transport, and we were due to catch our next train into the heart of Siberia. This entry was posted in Ger camp, Mongolia, Reflective, Terelj National Park, Trans-Siberian Railway, Ulaanbaatar and tagged adventure, Archery, Buddha, Dothraki, food, Game of Thrones, Gandantegchenling, ger, ger camp, Hike, Horse riding, Horses, journey, Litter, meat, monastery, Mongolia, monk, Morin khuur, museum, nomad, Rubbish, stars, Statue, Terelj National Park, Travel, turtle rock, Ulaanbaatar, wine, writing by Tiny Tino. Bookmark the permalink.